The holiday season is near! On Friday, December 14th please join us for an exciting holiday evening filled with celebration and charm! For the second year, JJ Pearce and Reservation HOAs will continue our new holiday tradition. 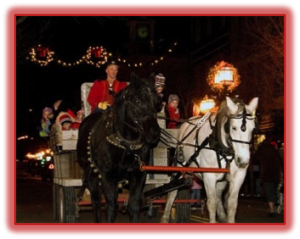 We joined forces again to bring you “Holiday in the Park” featuring festive horse-drawn wagon rides throughout our combined neighborhoods! Please join us for this memory making event! 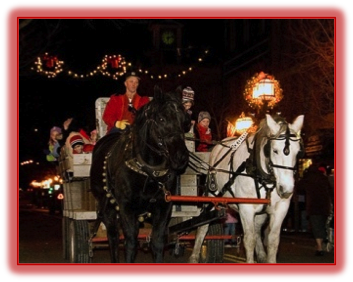 For one evening, horse-drawn wagons are available to tour our community’s beautiful light and decoration display. What could be better than nestling under a big blanket and sipping hot cider or hot chocolate while enjoying our festive streets?! Tours will depart the front parking lot of Mimosa Park. A “Special Guest” may make an appearance from the North Pole! Bring a camera and Christmas wish list just in case! You may purchase tickets in advance at Mimosa Park on Saturdays, November 10 or 17 from 10AM – 12PM. Cash (in exact change please) or check accepted. Our horse-drawn wagons seat a maximum of 20 guests. Tours are 30 minutes including loading and unloading time. Tickets are $7 per person by cash or check made payable to your HOA. Payment is made upon reservation. Children 2 and under ride free. Please select your desired tour time when purchasing your tickets. You may reserve an entire wagon or partial wagon for your extended family and/or group. No adjustments can be made to existing reservations. Reservations are not finalized until payment is received. Limited space is available so please hurry!